There are many types of snow shovels to choose from and finding the best type of snow shovel to fit the job and that will be the safest to use without causing injury is an important step in ensuring that clearing the next snowfall will not be the cause of a physical injury. Here is a brief list of different types of snow shovels so you can determine the best for you, depending on style, price and ease of use. 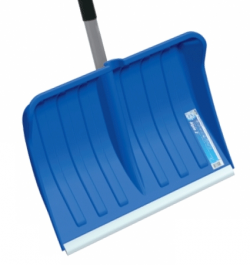 Plastic snow shovel: Manufactured from high strength plastics, resistant to cold and freezing, this type of shovel is lightweight and easy to use, snow will slide off the glossy plastic surface making the task of clearing snow easier. Metal snow shovel: Manufactured from metals including stainless steel, steel, and alloys, more robust than plastic shovels however these shovels are heavier and require more strength to operate, usually the choice of men rather than women or children. Aluminium snow shovel: Aluminium snow shovels are among the most popular types of shovels for snow. They are lightweight and durable, and do not break easily like plastic snow shovels sometimes do. These shovels are less expensive than steel or metal snow shovels but are a good choice for home owners that only occasionally need to shovel snow. Aluminium snow shovels are available in many different shapes and sizes. Steel snow shovel: Steel snow shovels are a bit heavier and more durable than Aluminium models. They are also more expensive. These snow shovels are the perfect solution if you live in areas that receive a decent amount of snowfall or you need to shovel large areas. Many small business owners use a steel snow shovel to clear off the areas outside of their business. Ergonomic snow shovel: Ensuring that your back is subjected to the least amount of strain possible, ergonomic snow shovels are a good option. These shovels have a bent S-shaped handle which take the strain off of your back when shovelling snow. Ergonomic snow shovels are recommended for anyone shovelling snow that has back problems and are a good option for anyone looking to take some of the strain off of their back muscles when shovelling snow. They are a little more expensive than standard snow shovels but worth the extra few pounds. Folding snow shovel – If you live or drive in an area that is prone to snow, it is a good idea to keep an auto snow shovel in your car. Since cars have limited space, the best option for an emergency snow shovel for your car is a folding snow shovel. Folding snow shovels are compact and do not take up much room in the boot of your car. A snow shovel should be a part of your emergency kit carried in your car whilst snow is on the road. Push snow shovel: Sometimes lifting snow is not the best solution to snow removal and that’s where push snow shovels come in handy. A push snow shovel is partially rounded on the bottom and is made to push the snow, rather than lifting the snow up to remove it to another location. Push snow shovels are often used in conjunction with lifting snow shovels to most effectively clear snow and are a good option for light snow falls to easily clear the ground. Pushing the snow also causes less back strain than lifting snow. Kids snow shovel: Kids love to help out when it comes to shovelling snow or love to just play in the snow with a shovel, but most large snow shovels are just too cumbersome for them to handle. Kids snow shovels are smaller sized shovels that are made specifically for kids to use. They are often plastic although you can also find Aluminium kid snow shovels for sale. When purchasing a snow shovel, it is advisable to not only consider the style of snow shovel you are looking to purchase, but also to make sure the size of the shovel is one that you can comfortably use. Some large snow shovels, while allowing for quicker snow removal, are just too heavy to be used by some people. Wide snow shovels are great for some locations but are not easy to use in narrower areas such as paths or around the car. In some cases, a small snow shovel is all that is needed or all that can be comfortably used. Another consideration to keep in mind when buying a snow shovel is how comfortable the handle of the shovel is. Different snow shovel handles will be comfortable to different people. The length and design of the handle are also important to test out prior to purchase in order to make sure the shovel is comfortable to use. If possible we recommend you try out moving a snow shovel along the ground and lifting it up and to the side before purchasing be sure it is comfortable to use. Many people have more than one type of snow shovel stored in their garage or shed, either to tackle different types of snowfalls or to allow for multiple people to help shovel the snow after a big snowfall. Most snow shovels are relatively inexpensive and will last through many years of snowfalls.